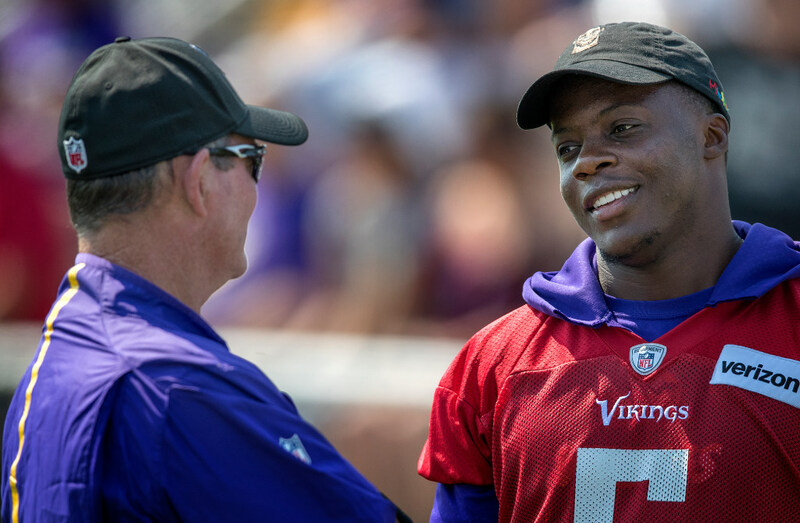 Does it sound like Mike Zimmer wants Teddy Bridgewater as his QB? It sounds like Zimmer is most comfortable taking his chances with Bridgewater on a new contract that would allow the team to keep its top-notch defense intact. Mike Zimmer didn’t leave much to be read between the lines when talking to local media Thursday at the NFL Scouting Combine. He was VERY blunt in his assessment of several subjects, including what the Vikings are thinking when it comes to their offseason QB conundrum. If you’re waking up from a blissful winter hibernation and just now catching up to things, the last three Vikings seasons have featured three different primary starting QBs: Teddy Bridgewater in 2015, Sam Bradford in 2016 and Case Keenum in 2017. All three were on the roster last season, and all three are set to be free agents in less than two weeks. So the question is whether the Vikings want to commit to one of those three guys or go after a big fish like Kirk Cousins in free agency. To that end, Zimmer’s comments were insightful. We should pause here to note that this is not Zimmer’s decision to make, at least not alone. GM Rick Spielman, new offensive coordinator John DeFilippo and perhaps even others will have a say on what they attempt to do, while the quarterbacks themselves can either chose to play in Minnesota or elsewhere. I will also point out out that I’m not at the combine and the quotes I’m using are not the full transcript of what Zimmer said. Still, what appear to be Zimmer’s most interesting comments had far more of an edge to them than Spielman’s did Wednesday and could offer a lens into how he feels about what the Vikings should attempt to do long-term. Cousins would easily be the most expensive option. If Zimmer is concerned about what a potential contract for Cousins would do to the team’s ability to maintain a stout defense and/or its ability to be competitive beyond a short-term window, that’s significant. If Zimmer sees Keenum — who could be expensive himself — as risky from a performance standpoint, that’s significant. If Zimmer doesn’t believe Bradford can stay healthy, that’s significant. If Zimmer only sees Bridgewater’s two-year absence as “concerning a little bit” and surrounds that with platitudes about Teddy — who, let’s not forget, was the QB hand-picked a few months after Zimmer was hired — that seems significant as well. It sure sounds to me like Zimmer is most comfortable taking his chances with Bridgewater on what would likely be a modest, incentive-laden contract that would allow the team to keep its top-notch defense intact. I’m not sure that’s the right answer or that’s how Spielman and/or DeFilippo feel, but I guess we’ll know soon enough how it all shakes out.